Nor-Lake started in 1947 as an equipment design and manufacturing company focused on ice cube makers for bar and restaurant establishments. Over time, they expanded and innovated in the commercial refrigeration industry as well. 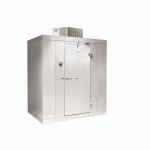 Nor-Lake is dedicated to high-quality, energy savings, and environmental safety and it is reflected in their foodservice equipment.